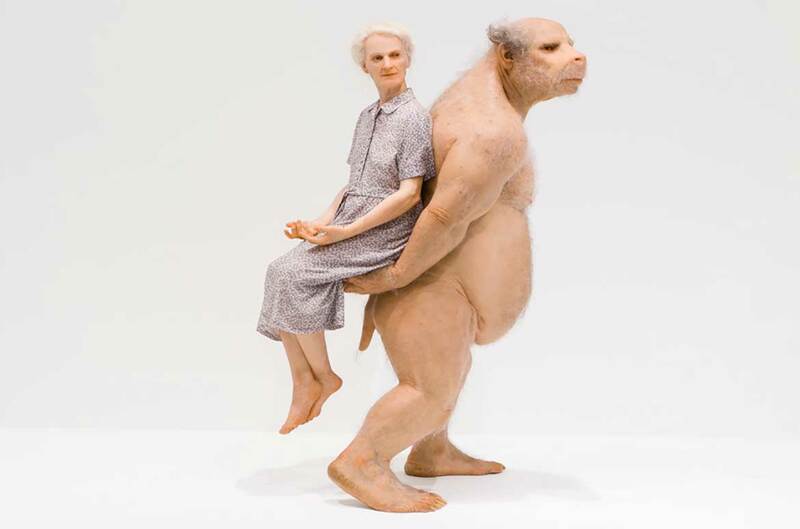 Patricia Piccinini’s The Carrier 2012 is both provocative and thoughtful, the artwork hints at what is possible from the creatures we may want to create in the not-too-distant future, making us focus our attention on what may lay ahead for us – is this relationship between humanoid and human how we will care for our ageing population? The carrier himself is a muscular male, strong and powerful with bright eyes and bear traits in his nose, tail and claws, he is balding, with age spots, yet his bear-like physique is able to lift the frail woman behind him with ease. 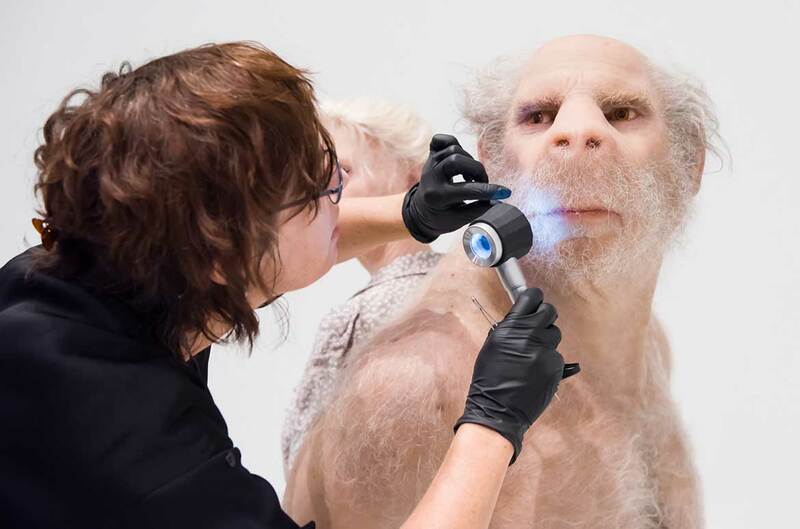 Conservator Catherine Collyer condition reporting The Carrier in preparation for the exhibition opening of ‘Patricia Piccinini: Curious Affection’. It seems the carrier and woman are connected in some way, physically but also emotionally, therein lies the conflict. Perched up high, she looks comfortable and content to rely on his assistance, yet what is their relationship, why is he carrying her, is it an equal partnership, or is he just performing a service? 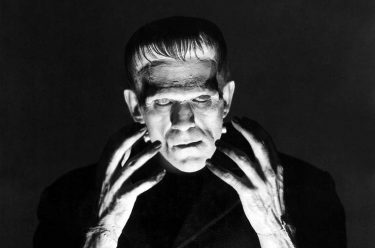 We can wonder if the carrier is the next step in post-human technology, his life seems perfectly engineered to the task he performs, and it is feasible that he is happily self-employed. Delve into Patricia Piccinini’s unique take on our future and decide for yourself before ‘Curious Affection‘ closes on Sunday 5 August. 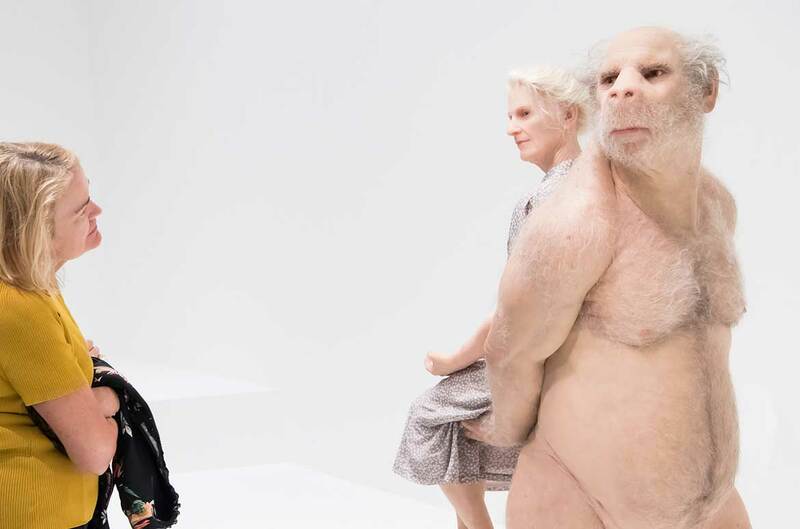 Known for her imaginative, yet strangely familiar, lifelike hybrid creatures, Patricia Piccinini invites us to think about our place in a world where advances in biotechnology and digital technologies are challenging the boundaries of humanity. 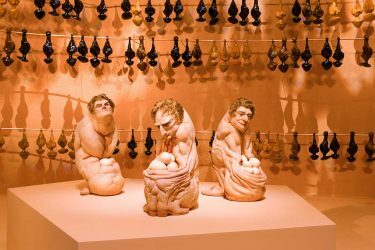 ‘Patricia Piccinini: Curious Affection‘ occupies GOMA’s entire ground floor with a retrospective of her most recognisable works from the past 20 years, and a suite of immersive multisensory installations. The exhibition is exclusive to Brisbane until 5 August 2018.